Thank you all. Thank you, Senator. I, too, am really pleased that President Obama and Mrs. Obama have come down to Dallas. I also want to welcome vice president, Mrs. Biden, Mr. Mayor, Chief Brown, elected officials, members of the law enforcement community. Today, the nation grieves, but those of us who love Dallas and call it home have had five deaths in the family. Laura and I see members of law enforcement every day. We count them as our friends. And we know, like for every other American, that their courage is our protection and shield. We’re proud [of] the men we mourn and the community that has rallied to honor them and support the wounded. Our mayor, and police chief and our police departments have been mighty inspirations for the rest of the nation. These slain officers were the best among us. Lorne Ahrens, beloved husband to detective Katrina Ahrens and father of two. Michael Krol, caring son, brother, uncle, nephew and friend. Michael Smith, U.S. Army veteran, devoted husband and father of two. Brent Thompson, Marine Corps vet, recently married. Patrick Zamarippa, U.S. Navy Reserve combat veteran, proud father and loyal Texas Rangers fan. With their deaths, we have lost so much. We are grief stricken, heartbroken and forever grateful. Every officer has accepted a calling that sets them apart. Most of us imagine if the moment called for, that we would risk our lives to protect a spouse or a child. Those wearing the uniform assume that risk for the safety of strangers. They and their families share the unspoken knowledge that each new day can bring new dangers. But none of us were prepared, or could be prepared, for an ambush by hatred and malice. The shock of this evil still has not faded. At times, it seems like the forces pulling us apart are stronger than the forces binding us together. Argument turns too easily into animosity. Disagreement escalates too quickly into de-humanization. And this has strained our bonds of understanding and common purpose. But Americans, I think, have a great advantage. To renew our unity, we only need to remember our values. We have never been held together by blood or background. We are bound by things of the spirit, by shared commitments to common ideals. At our best, we practice empathy, imagining ourselves in the lives and circumstances of others. This is the bridge across our nation’s deepest divisions. And it is not merely a matter of tolerance, but of learning from the struggles and stories of our fellow citizens and finding our better selves in the process. At our best, we honor the image of God we see in one another. We recognize that we are brothers and sisters, sharing the same brief moment on Earth and owing each other the loyalty of our shared humanity. At our best, we know we have one country, one future, one destiny. We do not want the unity of grief, nor do we want the unity of fear. We want the unity of hope, affection and high purpose. We know that the kind of just, humane country we want to build, that we have seen in our best dreams, is made possible when men and women in uniform stand guard. At their best, when they’re trained and trusted and accountable, they free us from fear. The Apostle Paul said, “For God gave us a spirit not of fear, but of strength and love and self-control.” Those are the best responses to fear in the life of our country and they’re the code of the peace officer. Today, all of us feel a sense of loss, but not equally. I’d like to conclude with the word of the families, the spouses, and especially the children of the fallen. Your loved one’s time with you was too short. They did not get a chance to properly say goodbye. But they went where duty called. They defended us, even to the end. They finished well. We will not forget what they did for us. Thank you all. As has been mentioned, in 2006 Laura and I came here to Warren Easton Charter High School a year after Katrina hit, and we are honored and pleased to be back on the tenth anniversary of that devastating storm. I can’t think of a better place to come here in New Orleans, except for some of the restaurants. (Laughter.) The slogan that guided the school when we first visited is true today: “We believe in success.” And because of the success that schools like this have achieved, you have given all Americans reason to believe that New Orleans is back and better than ever. In spite of the devastation, we have many fond memories. I remember sitting with [General Russel] Honore on top one of those big ships, strategizing. I think you were drinking; I wasn’t of course. (Laughter.) It is great to see you. We’re honored that you took time to come. Members of Congress, Members of the State House, Superintendent White, on and on: thank you for coming. I really want to thank the leadership of the school. I’m going to talk about them here in a minute, although I must confess, the Principal is always a teacher. So she tried to teach me how to Second Line with the band here at Warren Easton. (Laughter.) I know she didn’t say it, but she was thinking, this boy needs a lot of work. (Laughter.) So we’re thrilled we’re here. Thanks for your hospitality. In a cruel twist, Hurricane Katrina brought despair during what should have been a season of hope – the start of a new school year. Students who had recently gone back to school suddenly had no school to go back to. Many had nowhere to live. The floodwaters, as you all know better than most, claimed schools and homes alike. As Laura mentioned, the ground we’re on today was underwater. All of us who are old enough to remember will never forget the images of our fellow Americans amid a sea of misery and ruin. We will always remember the lives lost across the Gulf Coast. Their memories are in our hearts – and I hope you pray for their families. Hurricane Katrina is a story of loss beyond measure; it is also a story of commitment and compassion. I hope you remember what I remember, and that is 30,000 people were saved in the immediate aftermath of the storm by U.S. military personnel, by Louisiana law enforcement, and by citizens who volunteered. I hope you remember what I remember, and that is the thousands who came here on a volunteer basis to provide food for the hungry and to help find shelter for those who had no home to live in. There are people all around our country who prayed for you, many of whom showed up so they could say they helped a fellow citizen who was hurting. One of the groups that stepped forward to serve were the educators of New Orleans. At a time when it would have been easy to walk away from the wreckage, the educators here today thought of the children who would be left behind. You understood that bringing New Orleans back to life required getting students back to school. And even though some of the educators had lost almost everything you owned, you let nothing stand in your way. Today, we celebrate the resurgence of New Orleans schools – and we honor the resilience of a great American city whose levees gave out but whose people never gave up. Out of the devastation of Katrina, you vowed to do more than just open the schools. You vowed to challenge the status quo. Long before the great flood, too many students in this city drifted from grade to grade without ever learning the skills needed for success. Parents lacked choices and the power to intervene. Principals and teachers lacked the authority to chart a more hopeful course. It was a system that stranded more than sixty percent of students failing in schools. It was what I called the soft bigotry of low expectations. According to a new report by the Cowen Institute, the percentage of New Orleans’ students graduating on time has soared since Katrina. The percentage of students who attend schools that score better than the state average almost doubled. And so has the percentage of students meeting basic standards. You’ve got to ask, why? It just didn’t happen. A lot of it’s structural, and a lot of it requires strong leadership – people who stared into the eye of a storm and who refused to back down. And so Laura and I are here in New Orleans to remind our country about what strong leadership means, and we’re here to salute the leaders. It’s amazing what happened in this city after a storm wiped out the school system. Educational entrepreneurs decided to do something about the devastation, and the failure. I met a lot of them when I was President, and subsequently. Neerav Kingsland is one such person. After Katrina, Neerav took a leadership role at an organization called New Schools for New Orleans, where he worked with others to help launch dozens of new schools and to turn ideas for reform into reality. In other words, this isn’t just a theoretical exercise. It’s important for people for our country to look at New Orleans and realize this is an exercise in implementing a plan which works. Neerav was so encouraged by what he saw here, he was talking up the reforms that worked in New Orleans to other cities across the country. Isn’t that amazing – the storm nearly destroys New Orleans, now New Orleans is a beacon for school reform. (Applause.) Neerav represents the virtues that Bill Clinton and I had in mind when we announced the new Presidential Leadership Scholars program – and we are honored that Neerav was among the first class of scholars. Achieving these results took librarians who salvaged their collections from the watery wreckage. Listen, I know something about librarians. (Laughter.) I married one. (Laughter.) I’m really proud of the Laura Bush Foundation. She talked about the grants; she talked about Pam and Marshall. These are citizens who supported this Foundation who, like many around the country, they care deeply about the future of this city. I hope the students here – and I’m really thrilled you’re here by the way, thank you for staying awake (laughter) – I hope you realize the compassion of others in helping you realize a good education. In the stories of schools like yours, we see a determination to rebuild better than before. It’s a spirit much stronger than any storm. It’s a spirit that has lifted communities laid low by tornadoes or terrorist attacks. It’s a spirit that I saw in New Orleans ten years ago, and that is very evident today. Thank you. Thank you very much. President Turner, thanks. Members of the Board of Trustees, Provost Ludden, faculty, staff, distinguished guests, parents, and—most importantly—the Class of 2015. (Applause.) Thank you for your warm welcome, and I appreciate the invitation to be with you. As a proud member of the SMU community, I am honored to be here – truly honored – to deliver the 100th Spring Commencement address. I admire President Turner’s persuasiveness – (laughter) – and leadership. He runs a fantastic university. (Applause.) It is dynamic, diverse, and destined for continued excellence. He has assembled a strong administrative team. He is supported by engaged alumni, and he has an outstanding Board of Trustees. I also get to drop by classes on occasion. I am really impressed by the intelligence and energy of the SMU faculty. I want to thank you for your dedication and thank you for sharing your knowledge with your students. After four years of sitting through lectures, I have a feeling you’re not in the mood for another one. (Laughter.) What I have learned about graduation speeches is that they’re too long and rarely remembered. So I’ll keep this short. I just can’t attest to how memorable it will be. Fortunately, Moses recognized the call to serve something greater than himself. He answered the call, led his people, and history was made. You, too, will be called at some point. The question, as Mark aptly and artfully laid out, is: Will you be optimistic and hopeful, or pessimistic and cynical? Here are three reasons why you should be optimistic and hopeful. One, you are graduating from a great university. Your SMU degree will open the door to a wide variety of career options. Millions will never have had this opportunity. SMU has laid a foundation so you can reason, and continue to learn throughout your life. It has given you the tools to be productive citizens. One of the great strengths of America is our active public square. Issues are influenced by the will of the people. That is why an educated citizenry is so important to the success of our country. As SMU graduates, you are well-equipped to participate in these vital debates. My hope is that you speak out on the issues that matter to you. Participate in your Nation’s civic life as citizens, not spectators. You’ll come to learn that who you are is more important than what you have—and that you have responsibilities to your fellow citizens, your country, and your family. By taking part in American democracy, you will make our country stronger. Secondly, you are blessed to live in the greatest Nation – ever. (Applause.) Here you can strive and succeed as far as you dare to dream. It says something about our country that millions around the world are willing to leave their homes and families and risk everything to come here and realize the American dream. Their pursuit of that dream invigorates our national soul. It renews our country’s character. And it adds vitality to our culture. You live in a land that is compassionate and decent. Because we believe in the rights and dignity of our own citizenry, we are committed to defending the rights and dignity of people everywhere. America has liberated millions around the world from tyranny and terror. We’ve helped turn the tide against deadly disease in places like Africa. In our hearts we believe all are created equal under God. The liberty we prize is not America’s gift to the world, it is Almighty God’s gift to humanity. At home, there are thousands of platoons in the Army of compassion working to honor those beliefs. No matter what your career path, enlist. When you help another, you enrich your heart, and you strengthen the fabric of our collective goodness. Many of you have already made service a priority in your lives by volunteering during winter, spring, and summer breaks; and completing more than one-hundred community projects through Engaged Learning. I thank you for recognizing the timeless truth: of those to whom much is given, much is required. When Churchill uttered these words, many had lost hope in Great Britain’s chance for survival against the Nazis. Many doubted the future of freedom. Today, some doubt America’s future, and they say our best days are behind us. I say, given our strengths—one of which is a bright new generation like you—these are not dark days. These are great days. And finally, you can be hopeful because there is a loving God. Whether you agree with that statement or not is your choice. It is not your government’s choice. It is essential – (applause). It is essential to this nation’s future that we remember that the freedom to worship who we want, and how we want—or not worship at all—is a core belief of our founding. I have made my choice. I believe that the Almighty’s grace and unconditional love will sustain you. I believe it will bring you joy amidst the trials of life. It will enable you to better see the beauty around you. It will provide a solid foundation amidst a rapidly changing, somewhat impersonal, technologically-driven world. It will show you how to love your neighbor, forgive more easily, and approach success with humility—and failure without fear. It will inspire you to honor your parents and eventually be a better spouse and parent yourself. It will help you fully grasp the value of life—all life. It will remind you that money, power, and fame are false idols. And I hope and believe that God’s love will inspire you to serve others. Two U.S. presidents will make a joint public appearance in Africa on Tuesday. The following is the text of former President George W. Bush’s remarks at his presidential library dedication in Dallas on Thursday, as transcribed by Federal News Service. Hillary and Rosalynn, thank you for your service and your generosity. Condi introduced the world leaders with whom I had the privilege to serve. You’re good friends, and I’m honored to have you here in the Promised Land. I thank the governors, governor of our own home state and the other governors, mayors, state and local officials who have joined us. History’s going to show that I served with great people — a talented, dedicated, intelligent men — team of men and women who love our nation as much as I do. I want to thank David Ferriero, Alan Lowe and the professionals at the National Archives and Records Administration who have taken on a major task, and I am confident you all will handle it. I appreciate the architects, landscapers and designers, especially Bob Stern, Michael Van Valkenburgh and Dan Murphy. I want to thank the folks of Manhattan Construction as well as all the workers who built a fine facility that will stand the test of time. This is the first time in American history that parents have seen their son’s presidential library. Mother, I promise to keep my area clean. (Laughter.) You know, Barbara Bush taught me to live life to the fullest, to laugh a lot and to speak my mind, a trait that sometimes got us both into trouble. Dad taught me how to be a president. Before that, he showed me how to be a man. And ’41, it is awesome that you are here today. (Cheers, applause.) I welcome — I welcome my dear brothers and sister, as well as in-laws, cousins, nephews, nieces, uncles — all of you for joining us. Our family has meant more to me than anything, and I thank you for making it so. Today marks a major milestone in a journey that began 20 years ago, when I announced my campaign for governor of Texas. Some of you were there that day. I mean, a lot of you were there that day. I picture you looking a little younger. You probably picture me with a little less gray hair. In politics, you learn who your real friends are. And our friends have stood with us every step of the way. And today’s a day to give you a proper thanks. In democracy, the purpose of public office is not to fulfill personal ambition. Elected officials must serve a cause greater than themselves. The political winds blow left and right. Polls rise and fall. Supporters come and go. But in the end, leaders are defined by the convictions they hold. 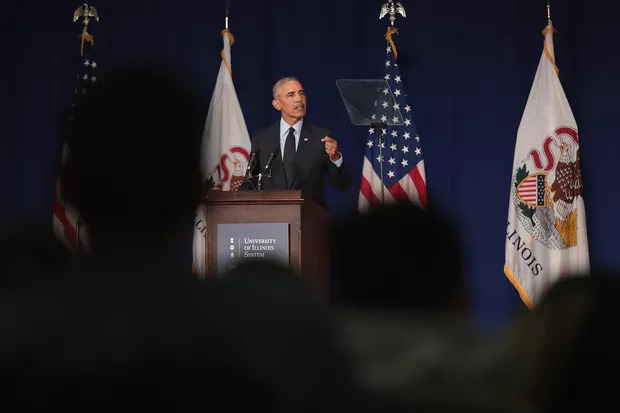 And my deepest conviction, the guiding principle of the administration, is that the United States of America must strive to expand the reach of freedom. (Applause.) I believe that freedom is a gift from God and the hope of every human heart. Freedom inspired our founders and preserved our union through civil war and secured the promise of civil rights. Freedom sustains dissidents bound by chains, believers huddled in underground churches and voters who risk their lives to cast their ballots. Freedom unleashes creativity, rewards innovation and replaces poverty with prosperity. And ultimately, freedom lights the path to peace. Freedom brings responsibility. Independence from the state does not mean isolation from each other. A free society thrives when neighbors help neighbors and the strong protect the weak and public policies promote private compassion. As president, I tried to act on these principles every day. It wasn’t always easy, and it certainly wasn’t always popular. The same principles define the mission of the presidential center. I’m retired from politics — happily so, I might add — but not from public service. We’ll use our influences to help more children to start life with a quality education, to help more Americans find jobs and economic opportunity, to help more countries overcome poverty and disease, to help more people in every part of the world live in freedom. 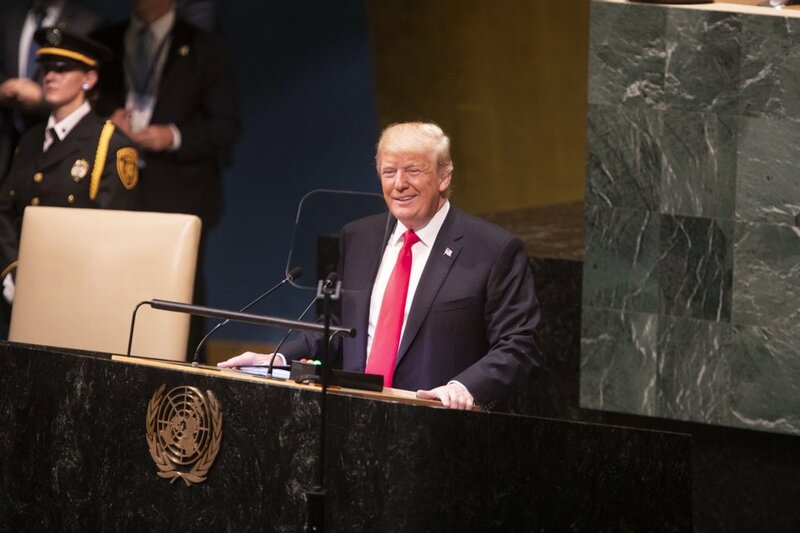 We’ll work to empower women around the world to transform their countries, stand behind the courageous men and women who have stepped forward to wear the uniform of the United States to defend our flag and our freedoms here at home. Ultimately, the success of a nation depends on the character of its citizens. As president, I had the privilege to see that character up close. I saw it in the first responders who charged up the stairs into the flames to save people’s lives from burning towers. I saw it in the Virginia Tech professor who barricaded his classroom door with his body until his students escaped to safety. I saw it in the people of New Orleans that made homemade boats to rescue their neighbors from the floods, saw it in the service members who laid down their lives to keep our country safe and to make other nations free. Franklin Roosevelt once described the dedication of a library as an act of faith. I dedicate this library with an unshakable faith in the future of our country. It was the honor of a lifetime to lead a country as brave and as noble as the United States. Whatever challenges come before us, I will always believe our nation’s best days lie ahead. God bless. PRESIDENT OBAMA: Thank you so much. (Applause.) Thank you. Please be seated. To President Bush and Mrs. Bush; to President Clinton and now-former Secretary Clinton; to President George H.W. Bush and Mrs. Bush; to President and Mrs. Carter; to current and former world leaders and all the distinguished guests here today — Michelle and I are honored to be with you to mark this historic occasion. This is a Texas-sized party. And that’s worthy of what we’re here to do today: honor the life and legacy of the 43rd President of the United States, George W. Bush. When all the living former Presidents are together, it’s also a special day for our democracy. We’ve been called “the world’s most exclusive club” — and we do have a pretty nice clubhouse. But the truth is, our club is more like a support group. The last time we all got together was just before I took office. And I needed that. Because as each of these leaders will tell you, no matter how much you may think you’re ready to assume the office of the presidency, it’s impossible to truly understand the nature of the job until it’s yours, until you’re sitting at that desk. The first thing I found in that desk the day I took office was a letter from George, and one that demonstrated his compassion and generosity. For he knew that I would come to learn what he had learned — that being President, above all, is a humbling job. There are moments where you make mistakes. There are times where you wish you could turn back the clock. And what I know is true about President Bush, and I hope my successor will say about me, is that we love this country and we do our best. Now, in the past, President Bush has said it’s impossible to pass judgment on his presidency while he’s still alive. So maybe this is a little bit premature. But even now, there are certain things that we know for certain. We know about the son who was raised by two strong, loving parents in Midland, famously inheriting, as he says, “my daddy’s eyes and my mother’s mouth.” (Laughter.) The young boy who once came home after a trip to a museum and proudly presented his horrified mother with a small dinosaur tailbone he had smuggled home in his pocket. (Laughter.) I’ll bet that went over great with Barbara. We know about the young man who met the love of his life at a dinner party, ditching his plans to go to bed early and instead talking with the brilliant and charming Laura Welch late into the night. We know about the father who raised two remarkable, caring, beautiful daughters, even after they tried to discourage him from running for President, saying, “Dad, you’re not as cool as you think you are.” (Laughter.) Mr. President, I can relate. (Laughter.) And now we see President Bush the grandfather, just beginning to spoil his brand-new granddaughter. So we know President Bush the man. And what President Clinton said is absolutely true — to know the man is to like the man, because he’s comfortable in his own skin. He knows who he is. He doesn’t put on any pretenses. He takes his job seriously, but he doesn’t take himself too seriously. He is a good man. We remember his commitment to reaching across the aisle to unlikely allies like Ted Kennedy, because he believed that we had to reform our schools in ways that help every child learn, not just some; that we have to repair a broken immigration system; and that this progress is only possible when we do it together. No one can be completely ready for this office. But America needs leaders who are willing to face the storm head on, even as they pray for God’s strength and wisdom so that they can do what they believe is right. And that’s what the leaders with whom I share this stage have all done. That’s what President George W. Bush chose to do. That’s why I’m honored to be part of today’s celebration. From left, President Obama, George W. Bush, Bill Clinton, George H.W. 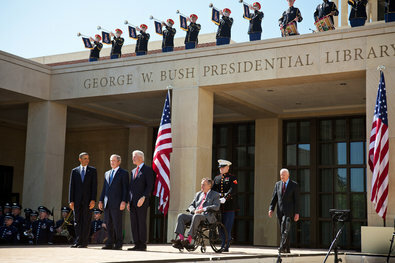 Bush and Jimmy Carter attended the opening ceremony of the George W. Bush Presidential Center on Thursday in Dallas. A hacker apparently accessed private photos and emails sent between members of the Bush Family, including both former presidents, and a spokesman for George H.W. Bush said a criminal investigation is under way. A hacker has obtained e-mails from friends and family of former presidents George H.W. Bush and George W. Bush, putting them in the public domain. A painting by George W. Bush of Barney, courtesy of the Bush family. President George W. Bush’s dog Barney has died of lymphoma at the age of 12, the former president said in a statement Friday. Bush, who has been learning to paint, published his own oil portrait of Barney as well as a Facebook album of the former first dog. 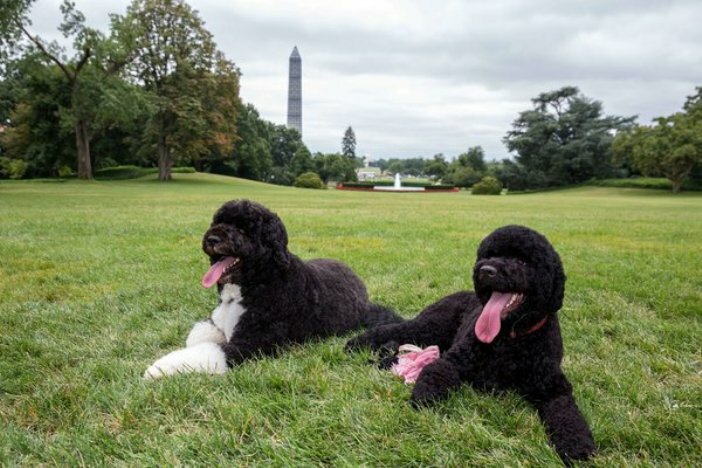 The Scottish terrier came to the White House with the Bushes; he was a gift to Laura Bush from Christine Todd Whitman, then governor of New Jersey, for the first lady’s birthday in 2000. While in the White House, he was the subject of annual “Barney Cam” videos and had his own Web site — Barney.gov. Barney guarded the South Lawn entrance of the White House as if he were a Secret Service agent. He wandered the halls of the West Wing looking for treats from his many friends. He starred in Barney Cam and gave the American people Christmas tours of the White House. Barney greeted Queens, Heads of State, and Prime Ministers. He was always polite and never jumped in their laps. Barney was by my side during our eight years in the White House. He never discussed politics and was always a faithful friend. Laura and I will miss our pal.